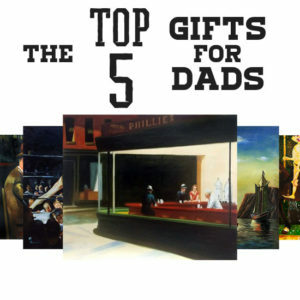 As father’s day approaches, we here at Overstockart.com want to help you find just the right gift for the father figure in your life. 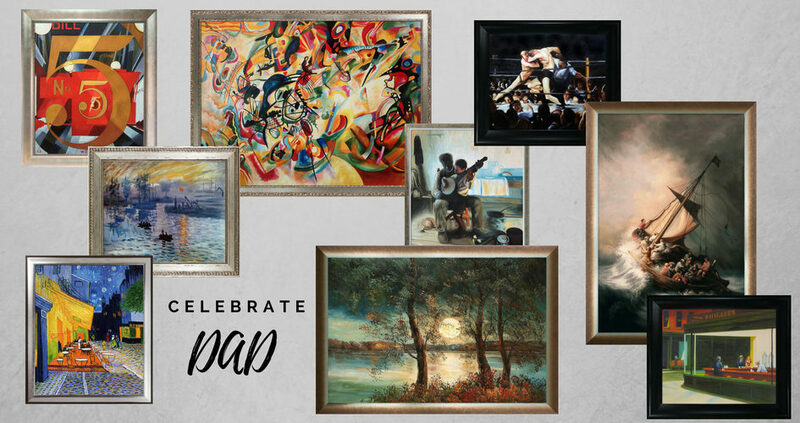 A piece of great art can be a thoughtful and sentimental token to show that special person how much you care. We offer such a wide variety of works that it might seem overwhelming to select just the right one. Here is a list of the most popular pieces chosen as a present for Father’s Day. 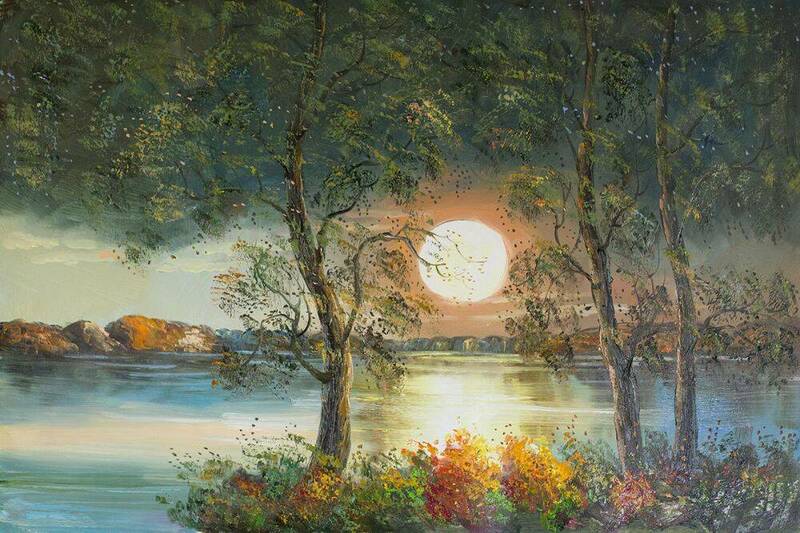 Moon is a beautiful image of a night time landscape painted by Justyna Kopania , with only the glow of the moon for light. It reminds the viewer of the magic that a night can hold. The water rippling beneath the reflection of the moon as seen from the shoreline is a serene setting. It is perfect for a father who enjoys being outdoors and longs for more night camping beneath the stars. 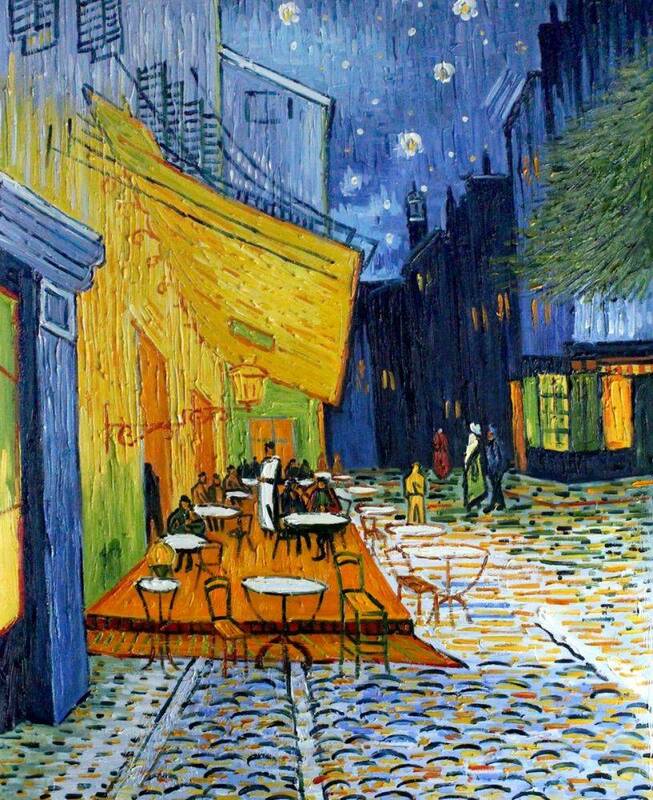 Vincent Van Gogh’s Cafe Terrace at Night (also known as The Cafe Terrace on the Place du Forum) was created at a local coffee house in Arles, France in 1888. Carefully recreated to depict the original scene, the vibrant combination of warm colors and depth of perspective are definitely unique to Van Gogh’s style of painting. This would make a great gift for a father who has an energetic personality and enjoys being the center of attention. 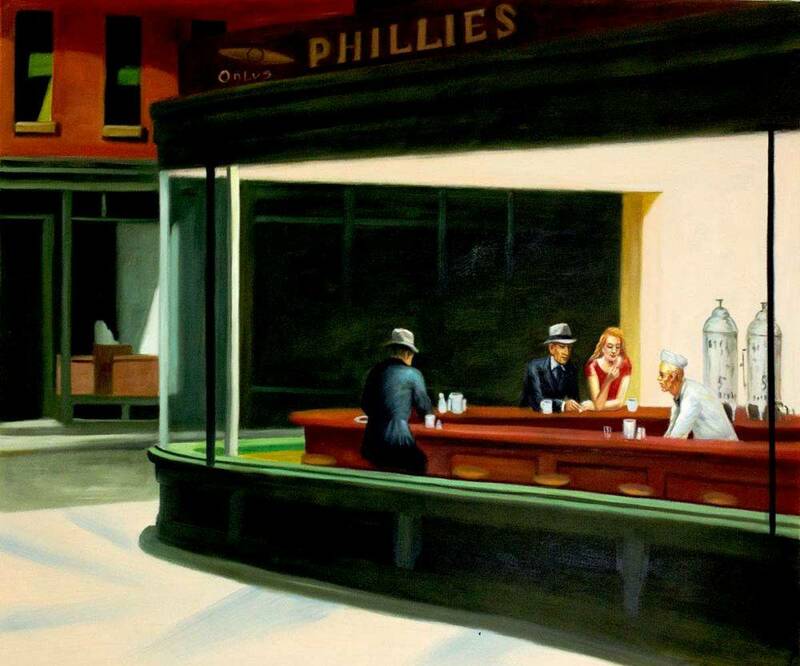 Inspired by a corner diner on Greenwich Avenue, Nighthawks by Edward Hopper is a seemingly simple scene with a strong, borderline eerie atmosphere. On the surface, it depicts three customers and a waiter at the bar, with then-new fluorescent lights beaming onto the empty street. But closer inspection reveals none of the night owls are speaking or even making eye contact. It would go perfectly with the classically designed room of a man who displays quiet strength to his family. 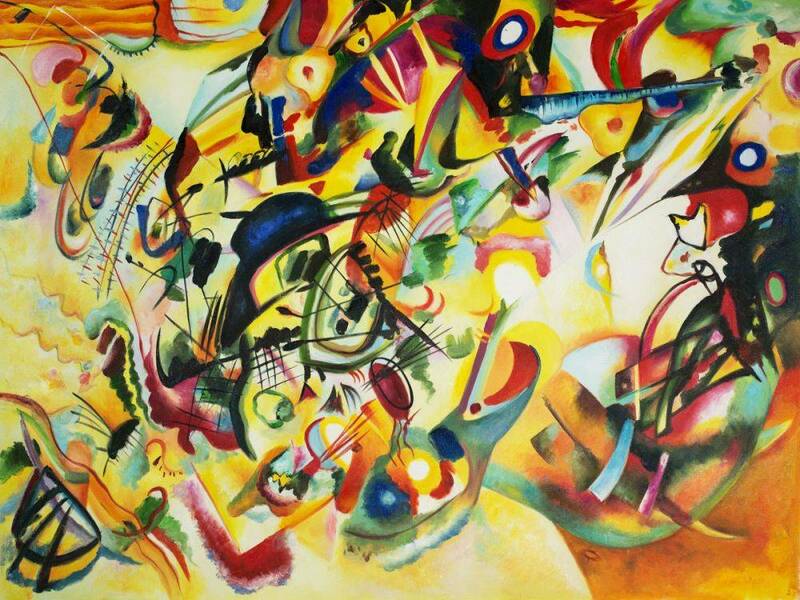 Inspired by the colors of Fauvism and Impressionism, Wassily Kandinsky’s goal was to use painting as an emotional language. He wanted to mimic music with his paintings. The abstract shapes in many different colors and a swirling pattern create a “noisy” image, and might call to mind an orchestral composition. Allow your guests to watch it long enough and they might begin to hear their own instrumental ballet in the background. Any father with a love of music will appreciate a piece like this to hang in their home. 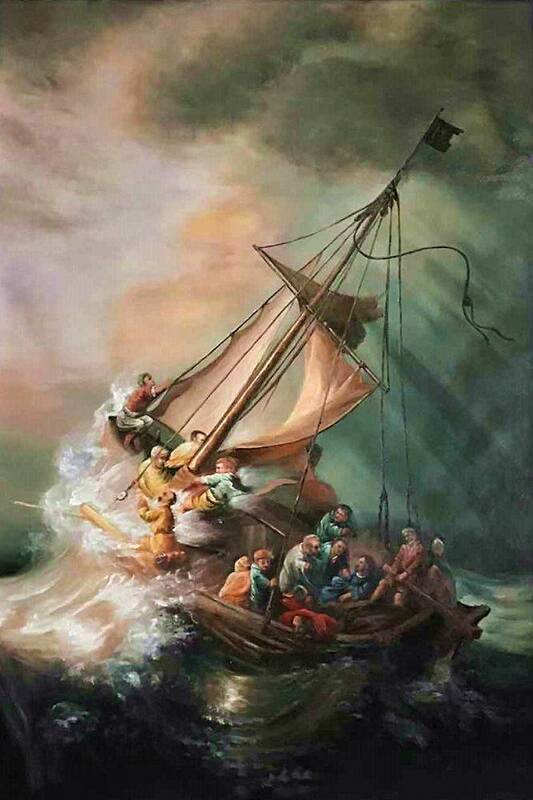 The Storm on the Sea of Galilee is undeniably one of the most fascinating works by Rembrandt. As Rembrandt’s only seascape, it’s notable for its intense use of color and action-packed scene. 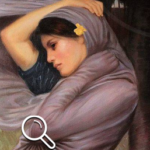 This painting was actually stolen in 1990 in the biggest art theft in U.S. history, and it has not been recovered since. That only adds to the mystery and excitement of the piece. It would be the perfect gift to give the thrill seeker in your family. 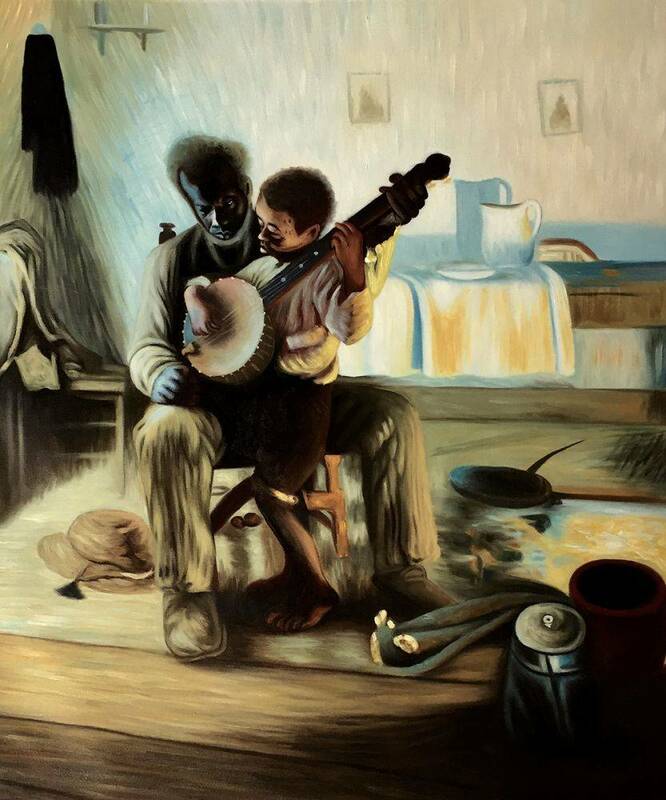 This intimate scene of an old man teaching a young boy how to play the banjo feels cozy and warm. There is a timeless sense of tradition in the patience he shows during the lesson. Though the background depicts humble means, the fact that they are engaged in a creative activity reflects richness in their life. It will remind any father of the important role traditions and keepsakes have in a family. While many of Monet’s most famous works feature bright, brilliant tones, this unique painting features mostly muted hues which serve to truly highlight the sun bursting through and casting a gorgeous glow upon the water. 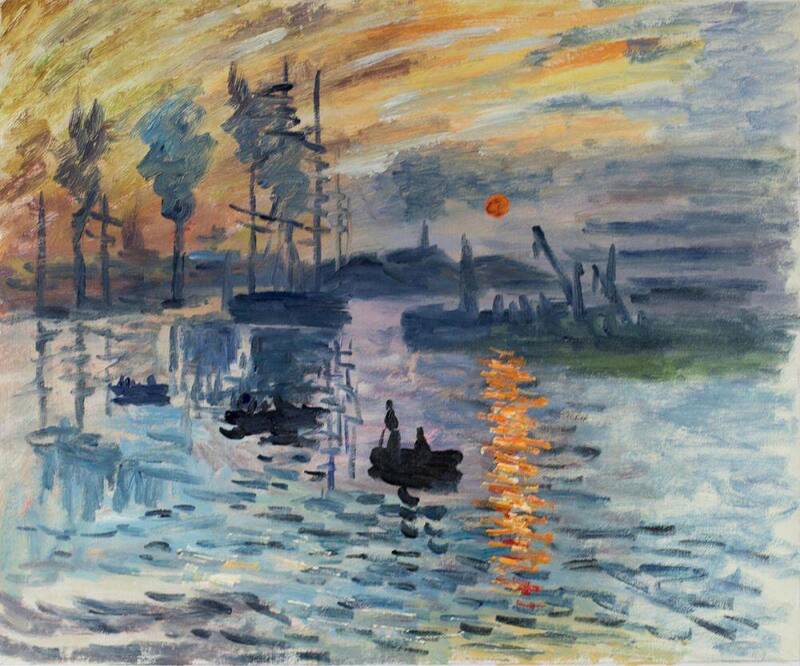 The Impressionist movement owes its name to this masterpiece, which displays the bold colors and blurred lines that are pivotal to the art movement. It was considered innovative when it debuted and has managed to maintain that novel feeling of wonder after all this time. If your father values the unique and timeless, this painting would be perfect for him. While prize-fighting was illegal in New York City in the early part of the twentieth century, underground fight clubs like Sharkey’s prospered while catering to the blood lust of enthusiastic spectators. 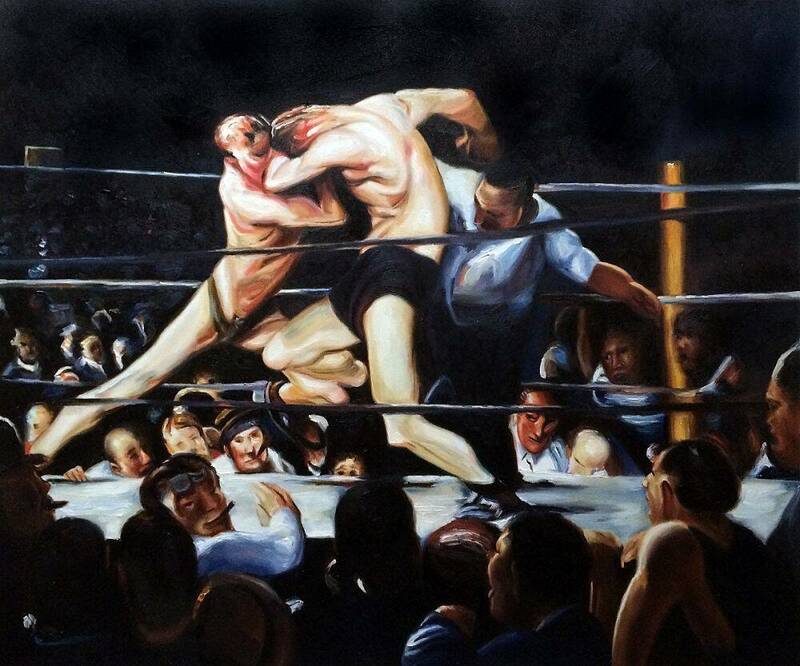 Bellows uses the comparison of stags locked in combat to relate the violent world of boxing to violence in nature. Considered an enduring piece of art, the intensity of this painting comes to life on canvas, and will be a conversation piece for any room. Give this to the father figure in your life who appreciates the struggle of life and has managed to pull out the win. 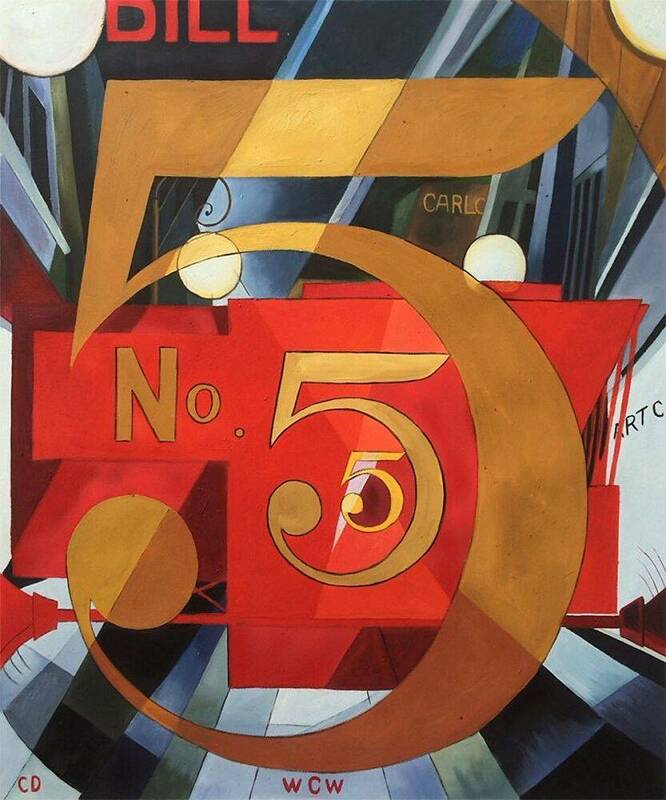 Demuth’s painting is a visual representation of the poem done in the distinct and geometric style of Precisionism for which he was known for. This piece, with its bold colors and clean, distinct shapes is considered one of the American classics in painting. It has a simple elegance that contributes to a room without overwhelming it. This would be the perfect piece of art for a father with refined taste and an eye for classic beauty. 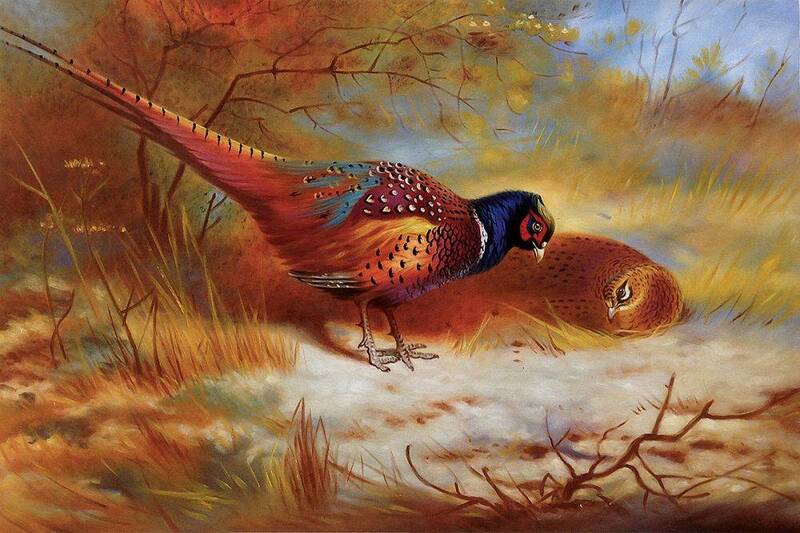 Archibald Thorburn was an avid outdoorsman who loved to paint wildlife, especially birds. Most of his work centers around the types of birds found in the English countryside and they are painted in their natural state, as if being observed quietly without disturbing them. This reflects the high level of respect the artist had for such creatures. If your father also shares this kind of esteem for the natural world, he would love to bring a piece like this into his home to admire all year long. Although this list offers a little of everything, it is not the full extent of what we carry. Feel free to also browse our Father’s Day gallery for more ideas. We know there is something here for every style and taste. We can also offer gift cards, if you would like to allow him to choose something to his liking. We want you to feel confident in giving him something he will love.